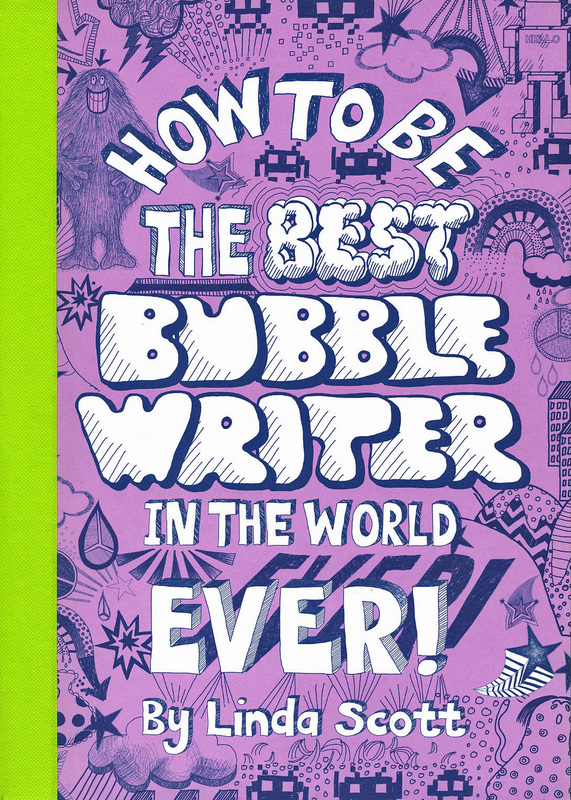 So this is part 2 of the "inchie" post and at the end I'll reveal the winner of the "How To Be The Best BubbleWriter In The World Ever" giveaway. 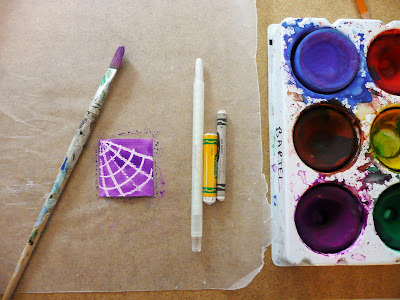 For the Spiderweb square I used a twistable white crayon as a resist. 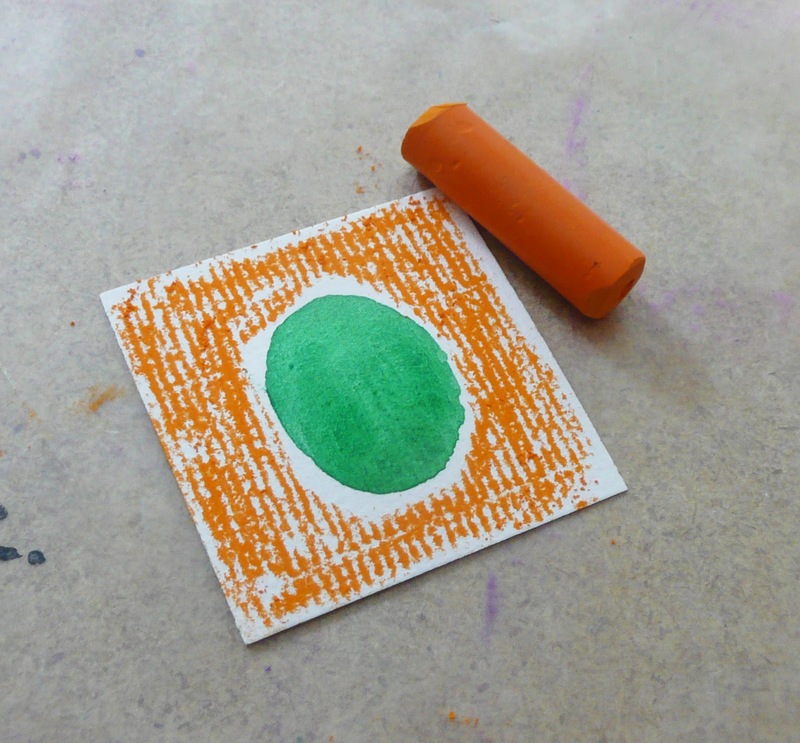 You can also use oil pastel. 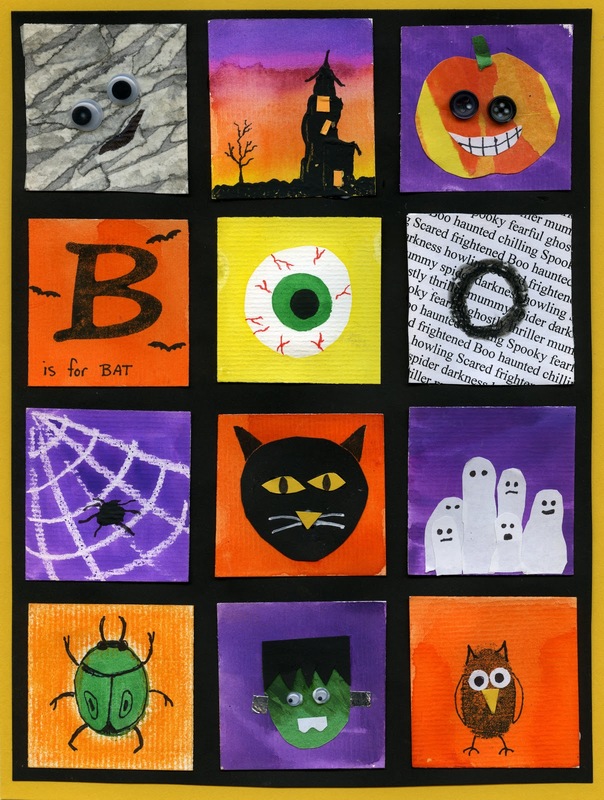 You draw in your spiderweb design on the white square (I know, I know, white on white is hard to see but if you angle it in the light you can see the sheen of the crayon). Paint it with purple tempera and your spiderweb will instantly appear. 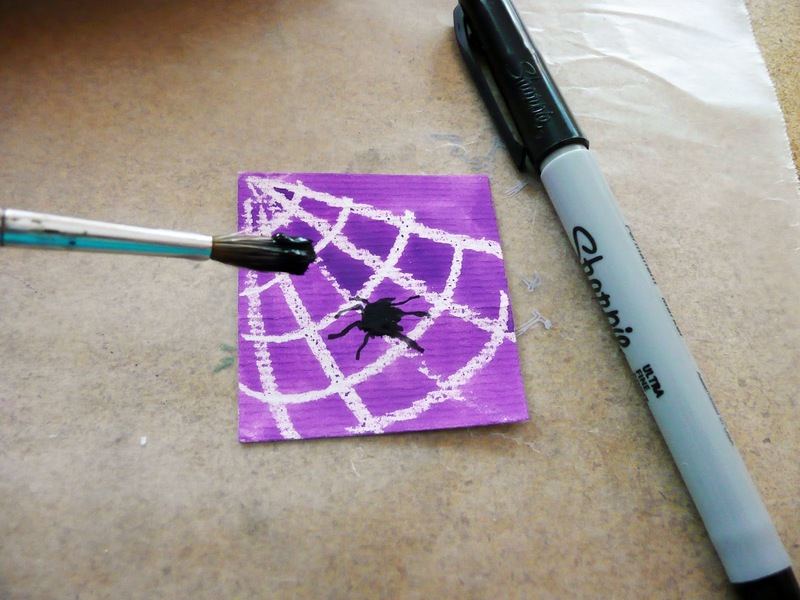 Draw in some spider legs with a sharpie and then add a blob of black paint for the spider. With the kids I think I'll use a Q-tip to make the spider. For the cat square I cut out a rounded triangle out of black paper and glued it on, used a sharpie to make the ears, cut out eyes from yellow paper and used the sharpie again to mark in the pupils. Glue eyes on. 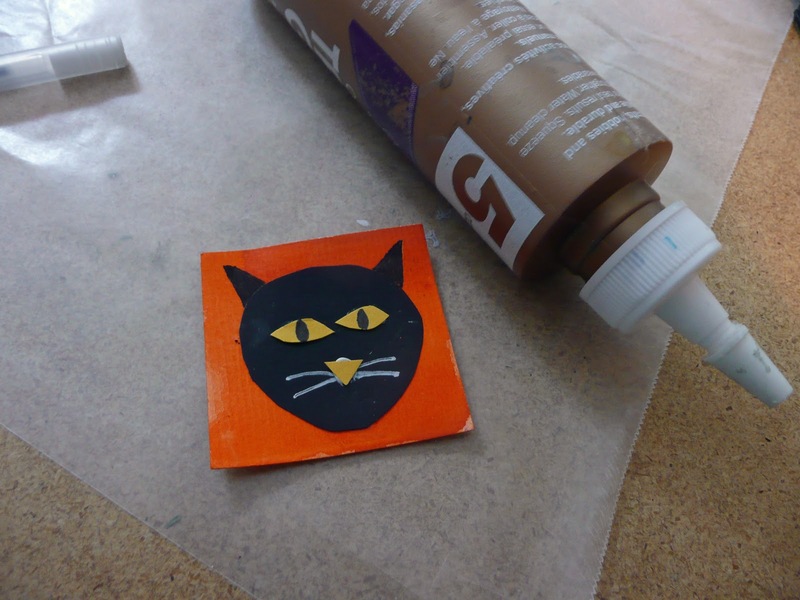 I used a white gel marker to make whiskers and then glued in a small yellow triangle. 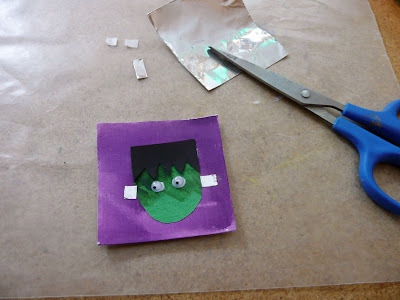 For really young kids you could base it on basic shapes and have them pre cut. For the group of ghosts square I painted the background purple. 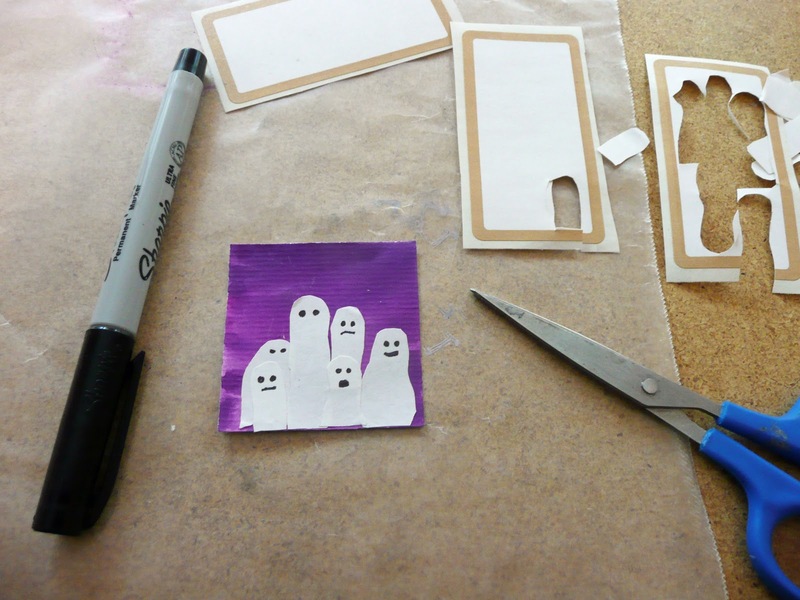 I used some white labels and cut out some ghost shapes. 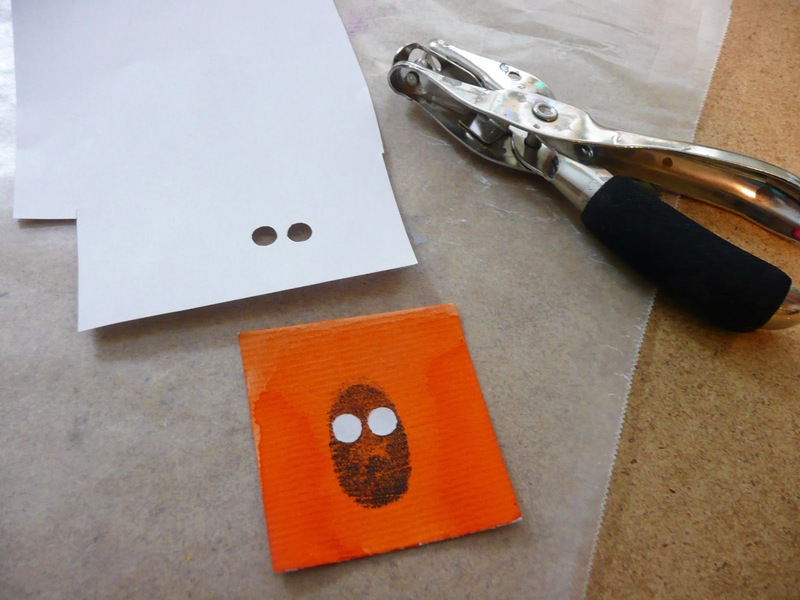 Stick onto your square and then draw in the eyes and mouths. 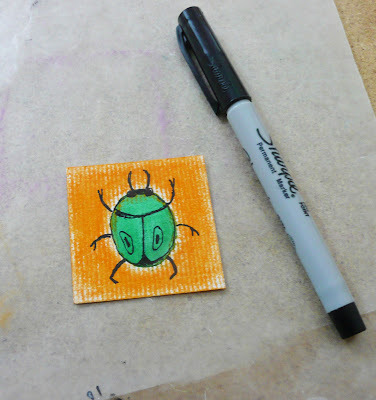 For the beetle, (Beetlejuice) square paint a oval and let dry. Taking chalk or pastel, color around oval and smear. 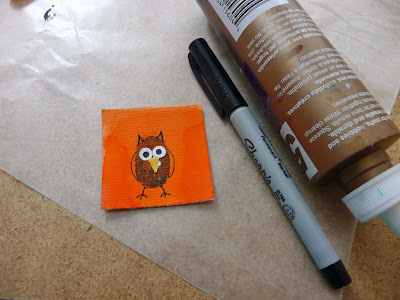 Add some details with (you guessed it) a sharpie......man I should have bought stock in that company ...mod podge too! 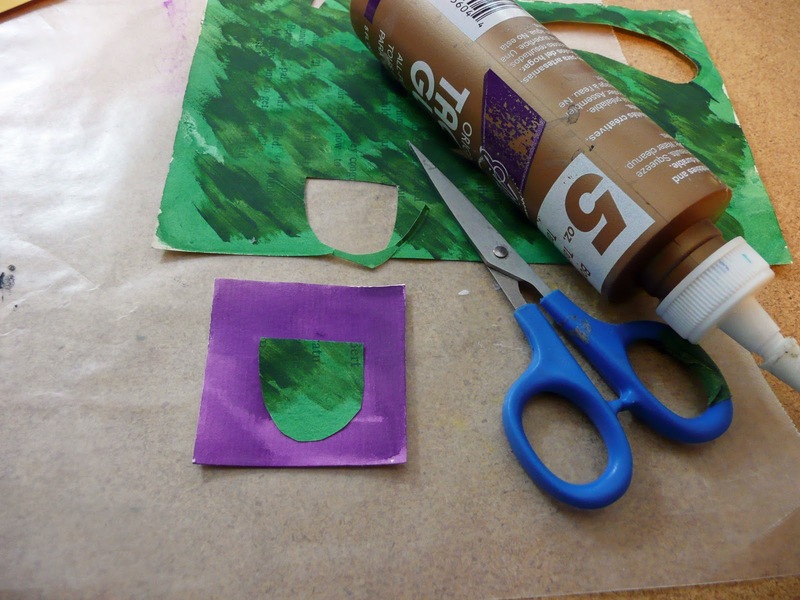 For Frank I painted a square purple, let dry and then cut out a pocket shape from old green painted paper (it pays to have that painted paper stash!) . Glue onto square. Then I cut out a rectangle from black paper and cut a spiky hairline (with young kids those decorative scissors work great for this), glue on to googly eyes. I also cut 2 little squares from my metal tape, you could use sequins or stickers. Add a mouth and that one is done. For the owl square I painted it orange and let dry. 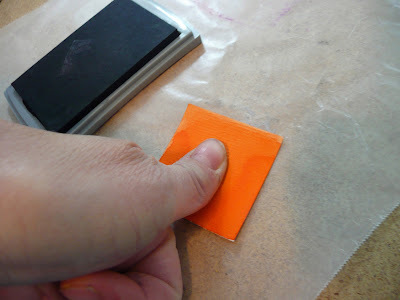 Using my stamp pad I stamped a thumbprint. Punched 2 eyes from white paper and glued those on. Color in pupils with you know who (Mr. Sharpie)! Add a few details (feet, wings, tuffs) and glue on a yellow beak. I should of done 2 as there was room. There you have it all 12 squares. Inchie Twinchie mania is taking over the school. 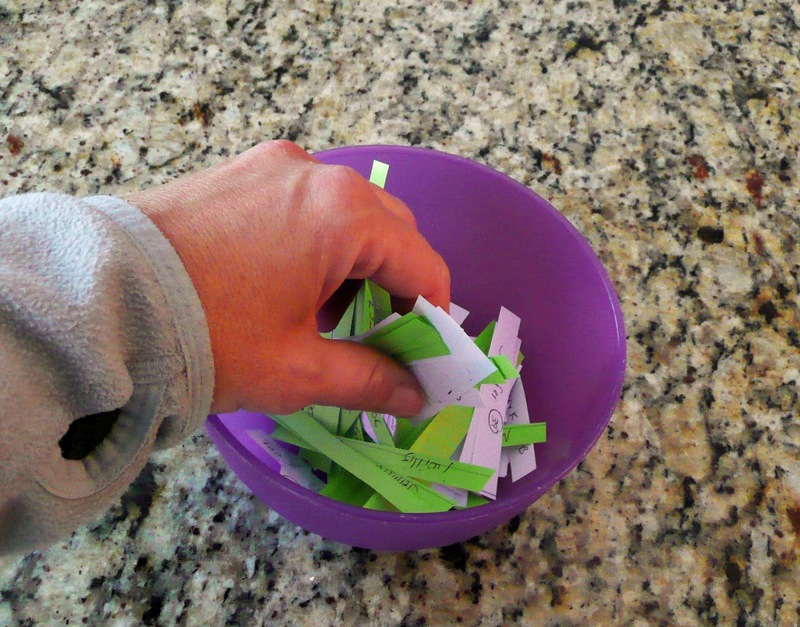 If you set this up as a center in a corner of your room you will always have a free time activity ready to go. I am cutting inchies by the hundreds for all the teachers. Give each child a ziploc to store them as you go and in no time you'll have collections to put on display! 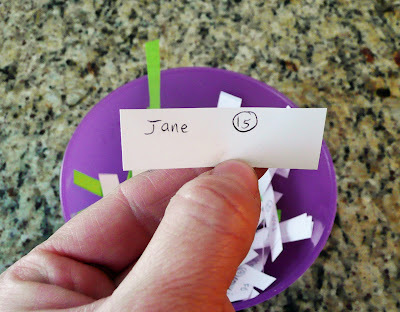 Congrats Jane! 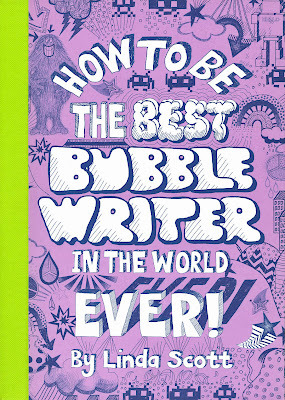 it is an awesome book and I know your students are going to love it. 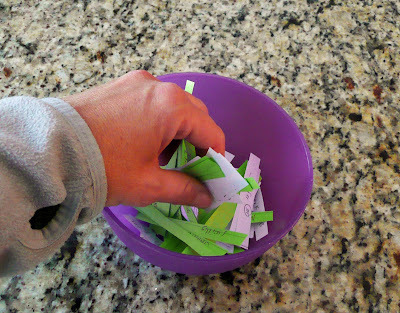 Thanks everyone for entering and there are more book giveaways coming so please enter again. That's it from me now, must return to school so grade 3 can finish painting those Batiks. See you next week. My two homeschooled boys loved making these. 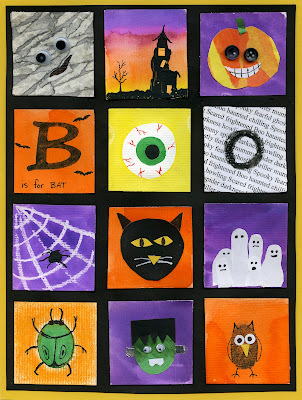 I have blogged about them here: http://home-edible.blogspot.com/2011/10/halloween-art.html. We love your site! !